I have had a good weekend playing around in my studio. 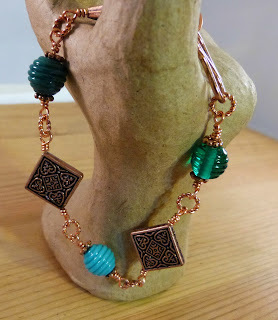 I wanted to share on of the pieces that I have made featuring beads from StudioJuls and copper. I was also got to attend the final ritual that TERRA will be putting on as we are disbanding. It has been a long run with them and I have been on the board of directors off and on for the past ten years. I am sad in a way but looking forward to having more time to play with my jewelry and a lot less stress all the way around. Love the lampwork and copper together, Shai! You must have mixed feelings about the disbanding of TERRA as it has obviously been a big part of your life. But as you stated, it is removing some stress from you. Maybe more fun with your creative time is just the ticket!